Cranfield University Blogs | We need to talk about plants! Last month I had the chance to take part in the New Scientist Live exhibition in London. The event was advertised as ‘a festival of ideas and discovery’ but it definitely was much more than that! It was a celebration of science at its best and an inspiration for the young and not-that-young-anymore. 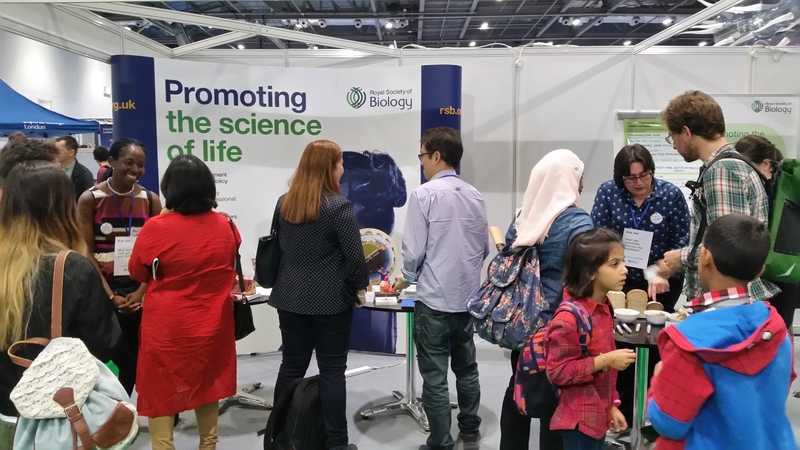 I spent my afternoon at the Royal Society of Biology stand, as part of their ‘Ask a Biologist’ sessions. These sessions were designed to promote the diversity of research in biology and to encourage interaction with the public. Three scientists from different research fields were available at each session to talk to people about their research. Each of us had to come up with a key question that would serve as an ice-breaker and a starting point for conversation. As a plant biologist, working on cereal grain development and quality, I decided that an easy way to get the conversation going would be to start talking about breakfast. 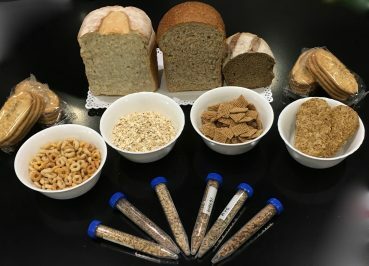 Bread, breakfast cereals, cereal bars, these are things that most people eat every day, so that would give me the chance to talk about different types of grains, their different characteristics and different end uses and quality profiles. That meant that I had to walk around that afternoon wearing a sign around my neck saying ‘Ask me how can scientists improve my breakfast’ – although I was not that thrilled about that part I have to say! Not only did I get to talk to people about my research on cereal grain development but also about our general concerns regarding food security and sustainability, about the development of new technologies, and how we can help as scientists to feed the growing human population, taking into consideration climate change and the limited resources available. I had a fantastic time, discussing my research with so many people from various walks of life that I would never had the chance to do otherwise. Each person came with their own concerns and thoughts on the subject and I had amazing conversations about all sorts of things, from crop domestication, gluten intolerance and wheat digestibility, to GM crops, pesticides, organic food and seed banks. One thing that seemed to always amaze people is how little we know about a staple crop, such as wheat, even though we have been breeding it for centuries. The fact that its genome is 6 to 7 times larger than the human genome, and so complex that it contains 6 copies of each gene and about 5 times more genes than humans, seemed to always take people by surprise. We have only just managed to get the full sequence of the wheat genome and we are now starting to understand the function of individual genes, but there is still so much to learn about a crop that has sustained the human population for such a long time. Outreach events, such as this one, are a great opportunity to raise awareness about the importance of plant science and its crucial role in crop improvement, future food sustainability and human health and nutrition. I can’t help feeling that plant biology tends to come across as ‘boring and pointless’ compared to other biology fields and that probably has to do with the way it is taught at school. But it is not difficult to get people interested and excited about plants once you get the chance to talk to them about how complex and amazing they are! As plant biologists, we really need to communicate our science better to the general public, make them understand how important plants are and help eliminate misconceptions and unfounded fears about emerging technologies. I am definitely looking forward to taking part in more such events and hope to see you there as well! Dr Kourmpeti is a Lecturer at the School of Water, Energy and Environment with an interest on cereal grain development and quality. She holds a degree in Agriculture from the Aristotle University of Thessaloniki in Greece and she has worked as an agronomist in the private and public sector before pursuing a career in research and education.